I am a proud member of the Chehalis Tribe. I am a photographer living in Seattle and I also do a little clothing design and sell on my etsy page. 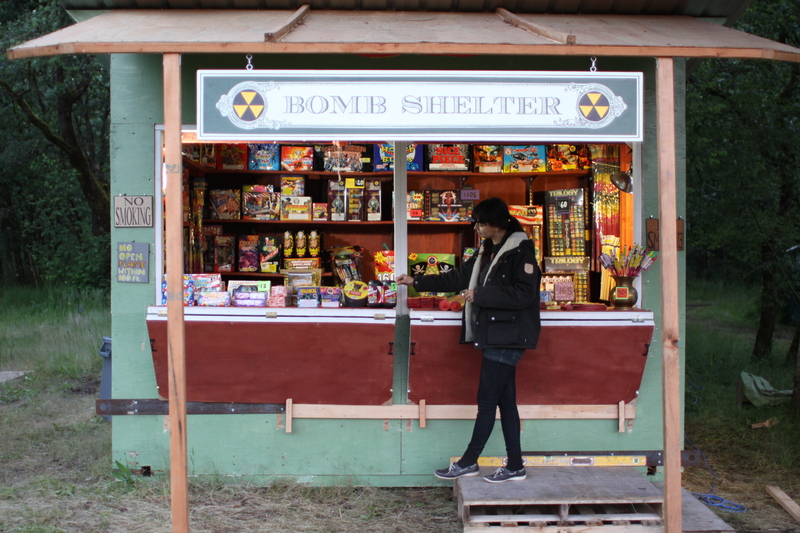 Every summer I take a journey back home to sell fireworks out of my stand, The BombShelter. We are located in Thunder Valley on the Chehalis Indian Reservation. I started selling fireworks for my mom at the age of fifteen, she has had a fireworks stand for over twenty years. I have had my own stand with my husband, Matt since 2009. I love my time on the rez selling fireworks, it keeps me connected to my family and my tribe. This blog is a journal about fireworks and hopefully gives you a little insight into the relationship between North West American Indians and Fireworks. love what do guys do. cant wait to see you and matt. Are you doing the bakers dozen this year. Thank you so much! We sure are getting the shelves ready now for this years bakers dozen. Thank you two so much! Have a wonderful 4th. Chuck! Can’t wait to see the crew. These guys are the BOMB!!! We come from Oregon every year on fathers day to go to casino and get fireworks from Bombshelter. This last sunday we got bunch of fireworks from them again but when we checked out we forgot to pack couple firecracker wheels…I was so bummed when I got home and saw they weren’t there. So I contacted Selena and she knew that we forgot them as well. She was super nice and even was willing to drive to Portland to deliver them. Fortunately, I had one of my drivers up in WA heading back to Portland so he stopped by and she passed a package to him…Whats crazy is when I got the box it was way more than what we forgot at her stand..I mean I was in shock!!! I am a customer for life! Thank you so much, I know thanks to Bombshelter our July 4th this year is going to be a BLAST! Thank you so much Victor!!! we are so grateful, we hope you had a great Fourth of July last year. We will be opening a little later than usual, opening June 20th.